This is the second time I add Power Function motors to the both models A and B of an official set ! When Alpha Mae (see A model) asked me to motorize the 42050 models, I answered her that the B one, the supercharged dragster, had no place for the battery box and would be awful with an enormous box locked to its rear wing, but, after thinking about it, I decided to use a train battery box and to place it just behind the driver’s seat, and to try to see what I could do of that very long and narrow car ! 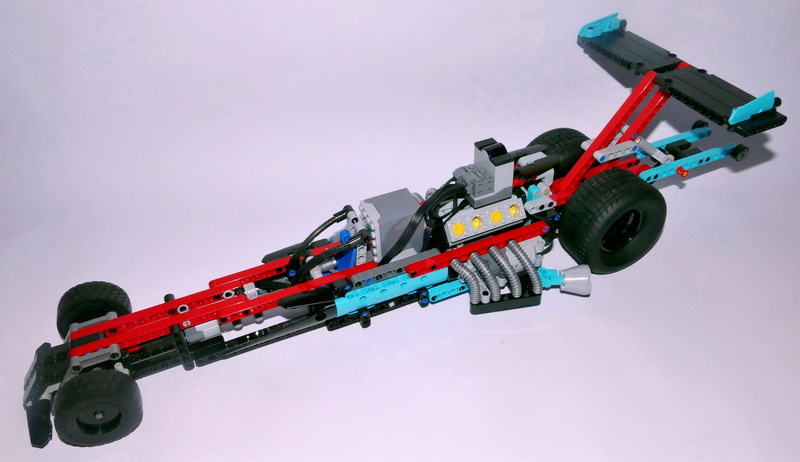 The body of the dragster has enough space to receive a servo motor for the steering, positioned on its side, near the front of the car. Once the steering installed and the previous parts allocated to this task removed, there’s more space behind the driver’s seat, some space that I used for the battery box. To keep the V8 motor operationnal, I choose to position the driving motor on one of the sides, under the hoses. There’s two sides so adding 2 motors was an idea I got imediately and this greatly improved the torque given to the dragster, giving it a much better acceleration. Overall this modification of the original model, once finished, is less close than the A modified model was of it’s original model. 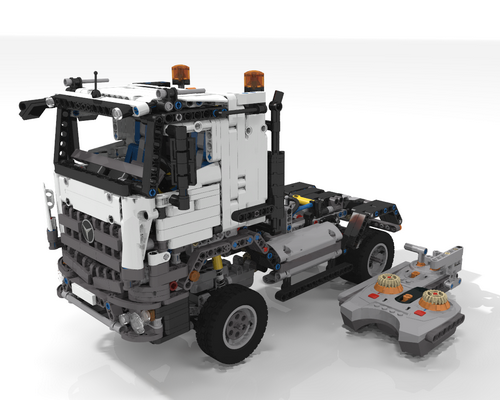 Several elements of the MOC moved a bit to free some space, some of them even disappeared, like the exhausts on the top of the motor (those made of chain links ! ), but it’s finally better than expected. Obviously, it’s size does not make it nimble, and the turning radius is terribly wide, but it’s quite fast, and fun to play with !